These shimmery Black And Rainbow Tinsel Eyelashes combine natural looking black fibers with flashy rainbow tinsel to create a subtly exciting look. Perfect for costumes, dress up, cosplay, drag, clowning, and more! 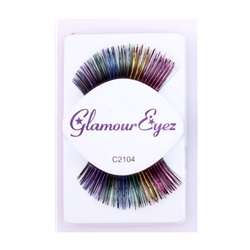 Black And Rainbow Tinsel Eyelashes are colored as pictured, and includes one pair of eyelashes.